Hatzi Ananias, who in the world was known as Anthony Barberakis, was the first monk, renovator and abbot of the Holy Monastery of Panagia Exakousti in the village of Malles in Ierapetra, Crete. He was born in 1837 in Ierapetra from rather poor but godly parents, John and Athena, who raised their child "in the education and admonition of the Lord". Anthony had not been educated, but from a young age was attracted to a divine education and wanted to receive the angelic schema of a monastic. He avoided any physical pleasure. As an infant he would not want to breastfed on Wednesday and Friday and stubbornly refused to touch the breast of his mother. He never ate meat, fish and cheese. Only on weekends and major feasts would he eat oil, and on Pascha he would eat shellfish, cuttlefish and squid. He was always barefoot and dressed in clothing with heavy and hard fibers, while his bed was the skin of an animal, usually a sheep, and his pillow was made of rocks. 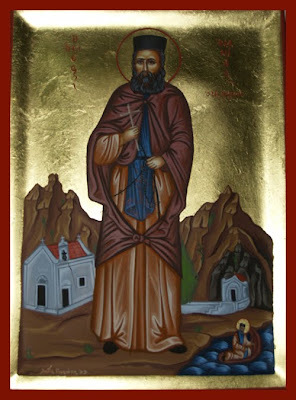 Hence, at the age of fourteen he left his family's house and fled to the Monastery of the Honorable Forerunner in Kapsa in Sitia, where he became a fellow-monk and student of Saint Joseph Gerontogiannis, founder of today's Kapsa Monastery. Here he received the name Ananias. After the death of Saint Joseph in 1870, Ananias was elected abbot of the monastery, but certain slanders later forced him to flee to Jerusalem. In Jerusalem he intended to visit the holy shrines, and it was from this pilgrimage that he received the name Hatzi (pilgrims to the Holy Land were given this title). Love and desire for his country brought him back to Malles in the year 1877, and from there he fled to Exakousti where he set about renovating the monastery. 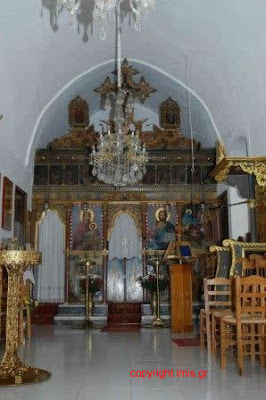 Hatzi Ananias restored the cave church which he dedicated to the Transfiguration of Christ and rebuilt the old church which he made into the katholikon of the new monastery. According to the French archaeologist Paule Faure he found "a ruined church with an unknown name and a small chapel, with the name of Panagia Exakousti." This is confirmed by other sources, indicating that Hatzi Ananias restored the church that was there and began building a new monastery near the cave. The completion of the renovation work of the monastery was five years later, as mentioned in the inscription on the basis of the bell tower of the church: "The 21st of August 1882 / The Holy Monastery Exakoustis / Remember, Lord, Your servant Ananias the Monk / And his Brotherhood." According to tradition the cave church is where the icon of the Theotokos was originally found by Ananias. It was not a church per se when Ananias restored it, but it was a natural looking cave church which he renovated into a church. As a child, Ananias came here on a rainy winter day as he was shepherding his flock nearby and fell asleep in the cave. While asleep he saw the Virgin Mary and she told him to look in the cave for her icon. The child awoke afraid and left. The next day he came to the cave again to escape the rain and fell asleep. He explored deep into the cave upon awaking and found the icon, which he took and brought back to his family home. His father got scared and he did not want to keep the icon in his house, because he considered himself unworthy to keep the holy icon there. He thus ordered his son to return the icon where he had found it. Since then, Anthony would go daily to that area and light an oil lamp before the icon. Later, with the help of his father, he established that small church in the cave. The enlightened personality and the sanctity of Hatzi Ananias attracted other monks, who would leave all their belongings to the monastery to help in its renovation. The surrounding land belonged to the family of Tsakiraki, who donated the land to Ananias for the establishment of the monastery. Young pilgrims were arriving daily to the newly-built monastery and candidate monks settled within. In 1881 there were eight monks in the monastery and two novices. 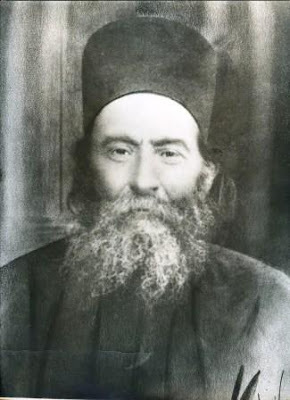 Until 1893 Ananias was the abbot of the monastery, at which time the Hieromonk Methodios Vrygionakis the Armenian was elected abbot, but nothing happened in the monastery without the opinion of Hatzi Ananias, whom everyone recognized as the founder. During these years the Brotherhood of the Monastery had substantial real estate properties and a sufficient number of goats. The following year Fr. Methodios resigned and was replaced by the elected abbot Hieromonk Hierotheos Barberakis, nephew of Hatzi Ananias. Shortly thereafter, due to difficult conditions, Bishop Ambrose of Sitia asked Hatzi Ananias again to supervise the monastery from 7 April 1898 to 3 February 1899. The progress of this great monastery was interrupted by the start of the 20th century, after the monastery was dissolved in accordance with the statute law of the Cretan State 276/1900 of the Cretan Orthodox Church. The ten monks moved and registered at Phaneromeni Monastery. But in 1903 the monastery was restored to Hatzi Ananias and his Brotherhood, and they returned to their beloved place, the monastery of their repentance. A few years later, Abbot Ananias died in righteousness on the night of Pascha on 22 April 1907, during the Anastasis service. In the conscience of all the local people, Hatzi Ananias was considered a saint. He possessed the gift of working wonders, healing the sick and clairvoyance, which he used in humility to help the people. He brought many sinners to repentance. His holy relics following his death gave off a beautiful fragrance and since his repose has had the grace to work miracles for all those who come to him with faith for help. The church celebrates his memory on April 22 every year. As expected, following the repose of Hatzi Ananias, the monastery began to fall into decline as the main attraction was no longer alive. By 1920 there were only four monks, while in 1935 the monastery was left desolate. The local church authorities sold to the community what estates were left. During the German-Italian occupation in the 1940's the cells of the monks were looted and devastated. Not only was the cave Church of the transfiguration destroyed, but the katholikon was also. The cell of Fr. Joachim Hatzakis was also destroyed, who would serve the Divine Liturgy there regularly. 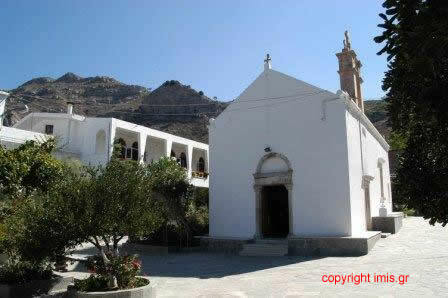 In 1961 the Church of Crete was given back the property to Panagia Exakousti. On 13 August 1963 a new abbot was chosen for the monastery to help restore it, Fr. Joannikios Androulakis. Until this time the cells of the monks were stalls for animals, but with the help of the locals the monastery gradually was restored and many trees planted. Water was irrigated and electricity supplied to the monastery. Fr. Joannikios began to have daily services and once again the monastery became a spiritual center. Fr. 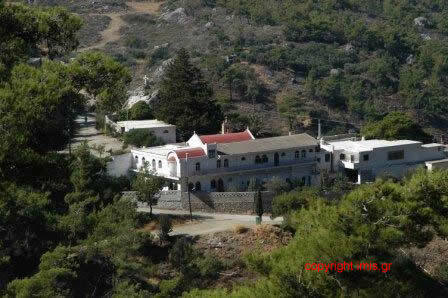 Joannikios stayed at the monastery until 1976, at which time Bishop Philotheos II of Sitias converted it into a convent. He brought nuns from the Monastery of Koroni and the first abbess was Fevronia together with five nuns. These nuns continued the great restoration of the monastery, and even built a new chapel dedicated to the Holy Fathers and Mothers. The monastery celebrates its feast yearly on September 8th and many pilgrims come to celebrate and support the monastery. Read more at the website of the monastery here.